Continental Breakfast and Chauffeur services upon owners availability! Come and relax at your romantic, private suite overlooking the vineyard of Dono Dal Cielo (we have a secret gateway) to the vineyard. Just 7 mins from I-80, half way between SF and Reno and set within Placer County's wine trail and very close to Auburn's running, biking, hiking and kayaking opportunities. Our beautiful guest suite is the perfect place to recharge with lazy breakfasts at the pond or a glass of wine by the fire pit at the end of the day. We are a “babe-in-arms” home and have babysitting on sight. We are not able to have mobile children at this time. Check Dono Dal Cielo website for summer concert series. Extra charge for those weekends. english, Deaf/HoH friendly- ASL fluent on premises. Our family has lived in this area for 50 years, let us help you make the most of your precious time. There is something for everyone in Placer County. An hour to skiing and sledding, and minutes from hiking and running trails, mountain biking and a fantastic network of road cycle routes, kayaking, rafting,shopping,wineries, breweries,fine dining. Come and enjoy our little piece of heaven at the Double MK Ranch. We are located on the Placer County wine trail. We will try to accommodate all request. So we can make your stay unforgettable. Chauffeur available Please speak with owner to make arrangements. My favorite part of our stay was the use of the huge patio with grill and a beautiful view of the pond and skyline. I loved being around all of the animals and hearing the peacocks in the distance. Our dog loved running around the property and played like she was a puppy again. Located on the bottom floor of the owners home you sometimes hear noises from above but it was never really a problem. The room itself more than made up for any issues with the location. 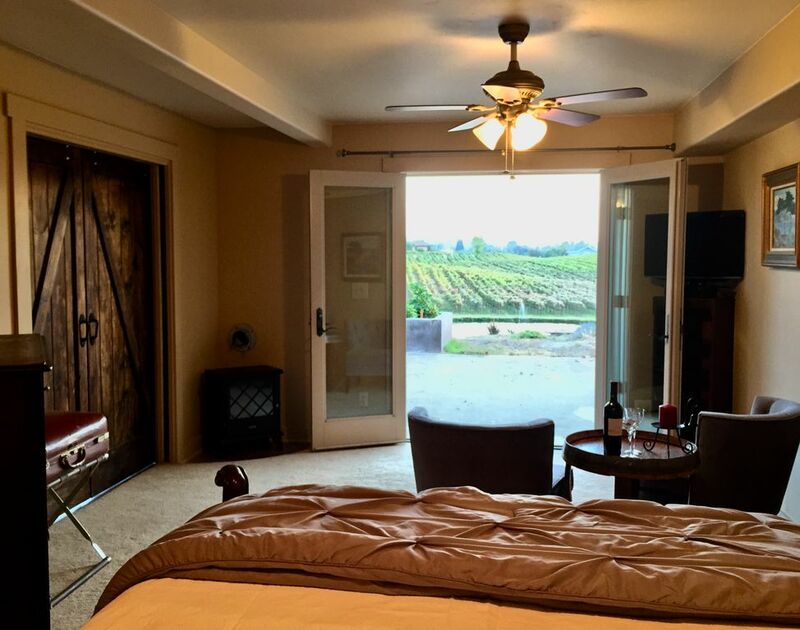 Clean, comfortable and overlooking the vineyards, it couldn't have been better. What made it special were the extras that you get. Included in the room were a pool table, an air hockey table and a movie theater. The private entrance and sitting area were also nice bonus'. Also want to add that they had two of the sweetest dogs that you're likely to come across in your travels. We feel just as if not more Thankful that you chose us. Please keep in touch. We think of you everyday. Felt like you were in Italy!! Absolutely stunning views and a beautiful room. We love the room, bathroom, walk out patio and pool table all added to the charm. Fresh water and light snacks were waiting for us. The home is located close to the wine trails. It was been a joy staying here. Listening to the sounds of birds, cows, water fountain and be greeted by the the big labs every morning made our day. We are located 7 minutes from Auburn and 7 minutes from Lincoln. 1 hour from skiing and 1 1/2 hr. from Tahoe 2 1/2 hr. From the Ocean. Very central for day trips.